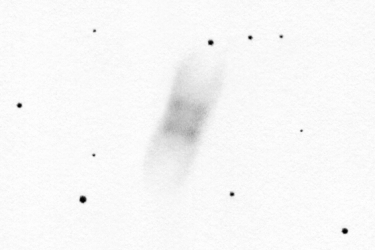 M 99 drawing inverted into positive. 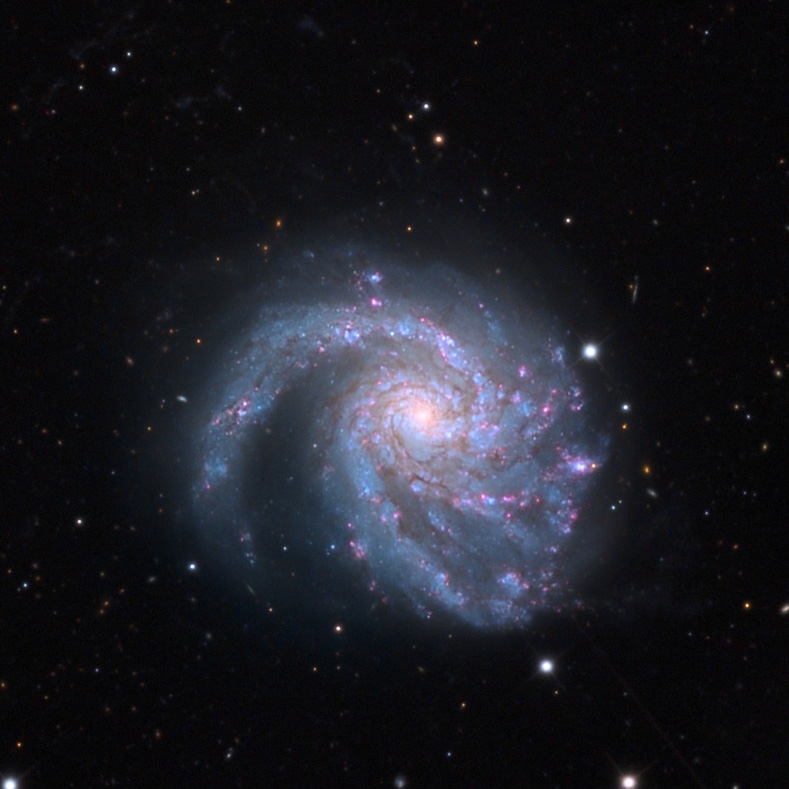 M 99 (Messier 99) is a beautiful and completely unique spiral galaxy in the Virgo Cluster. 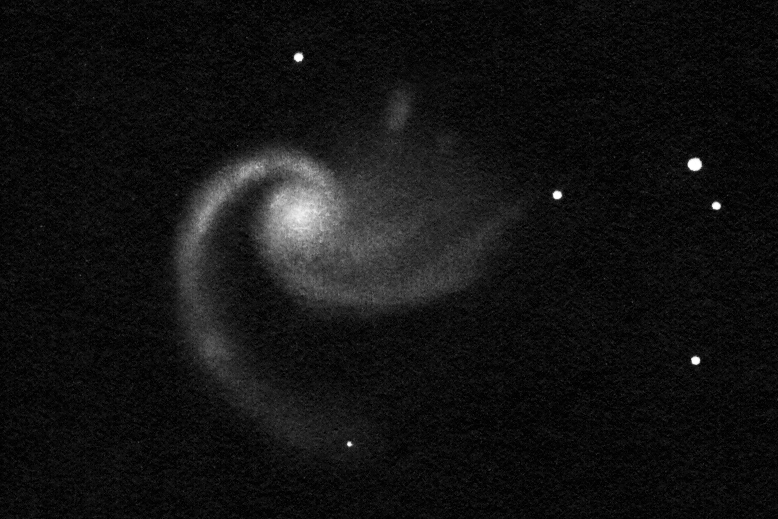 The two main arms are clearly visible in the eyepiece of the telescope: the thinner, brighter, "lonely" arm and the thicker, fan-shaped arm. The former one is inhomogenious and contains some bright spot of different sizes, shapes and brightnesses. The thicker arm contains a few diffuse threads and it fades away rather unevenly. 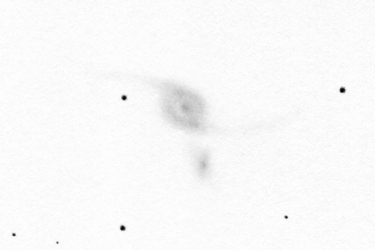 The little separate spot - a star fomrnig region - above the thick arm is a very exciting detail. The galaxy doesn't have a stellar core. The core region looks like a globular cluster without resolution - the whole central part is slightly inhomogenious. 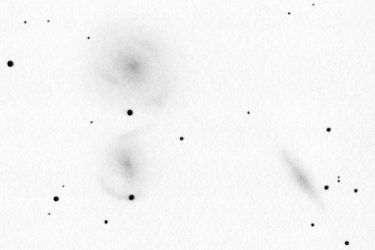 The peculiar shape of the galaxy is probably due to a former high-speed collision with maybe M 98. 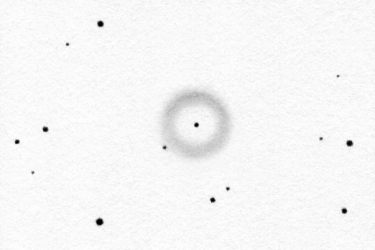 M 99 is in connection with a very interesting object, VIRGOHI 21. 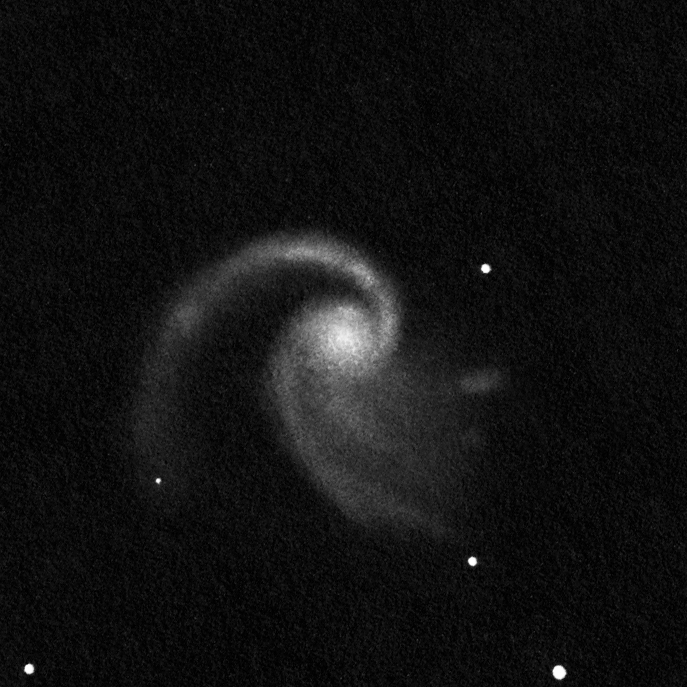 The latter object is a HI (neutral hydrogen) cloud and it was formerly thought to be a dark galaxy. 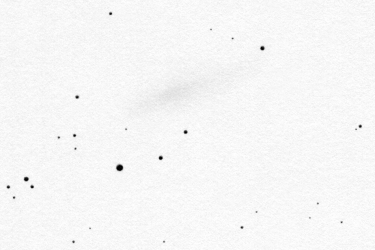 But it is probably a tidal tail, a remnant of the formar collision. 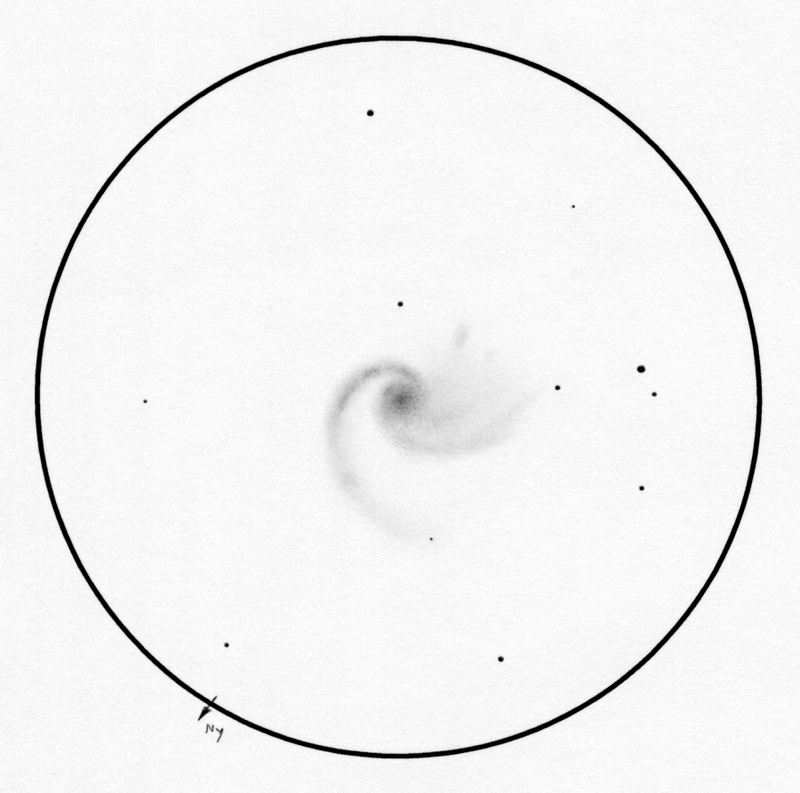 VIRGOHI 21 lies about 20' to the Nortwest of M 99 (bottom right in the drawing) well outside the telescope's 15.5' field. But it is not visible in optical wavelengths only the neutral hydrogen's 21 cm radiation can be detected. 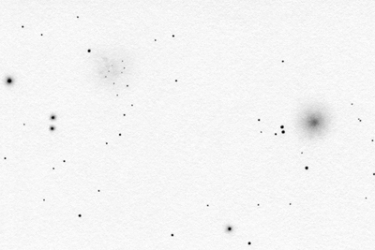 You can see Adam Block's photograph of M 99 to the left made using a 32" telescope. I cropped the original photograph and rotated and cropped my inverted drawing so that they show about the same area of the sky.